I’ve been enjoying the past three weeks of The Summer of Color challenge. Week 4 is no different. 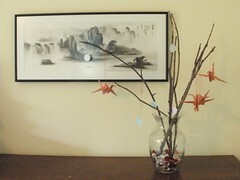 This week’s color is yellow, and I made two origami window stars. Both of the window stars use some of the folds that I regularly use in the suncatchers I make, but each one is my own design. The star on the left side is folded 11 times per point. 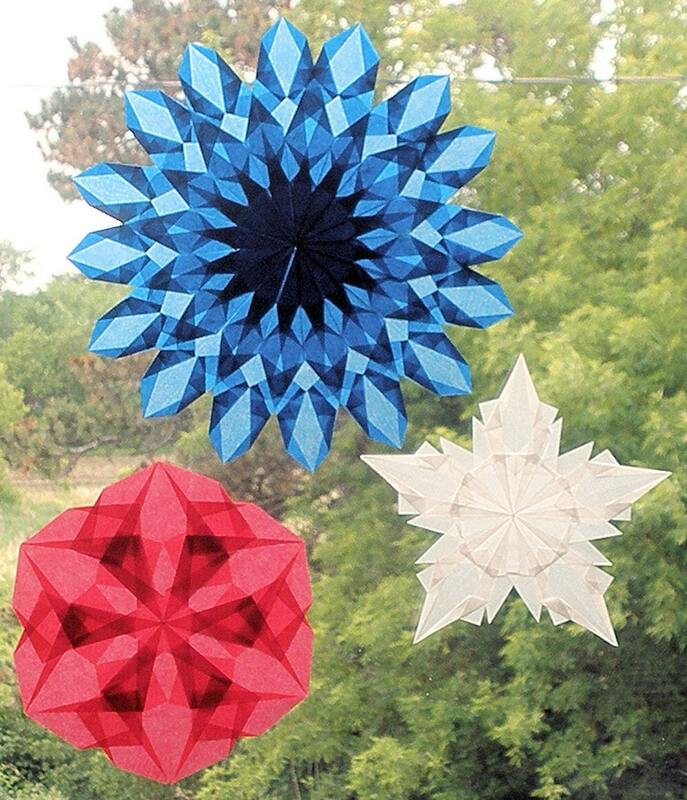 With 8 points, that’s 88 folds to make the star. 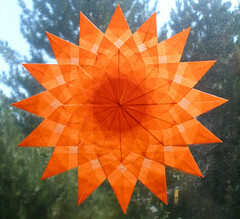 The suncatcher on the right side is folded 17 times per point. With 8 points, it is folded 136 times. 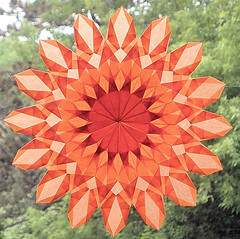 By playing around a bit with the size of the paper used for each point, the way that the points are folded, and then the final arrangement of the points – it’s possible to create a variety of different suncatchers. I’m also working on a multi-week/multi-color quilt. Each quilt square will have a variety of fabric prints all in one color. For each week of The Summer of Color challenge, I’m making two quilt squares. Nothing fancy…just 7 rows of fabric of various widths. The final size of each quilt square is 12 inches x 12 inches. By the time the challenge is done, I’ll have 20 fabric squares – enough to make a nice size quilt while using up scraps of fabric.